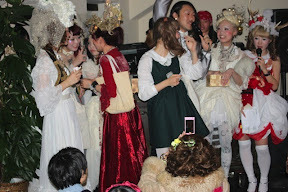 Photos from Grimoire's "White Christmas" party are up! The party was Saturday night, and featured infamous Tokyo Dj Leon CandyCane. The first 100 guests also received the newly designed Grimoire eco totes. As per usual, the Grimoire staffers were dressed to the nines with elaborate dresses and even more elaborate hairstyles. Click here and here for the Grimoire blog entries and snaps. 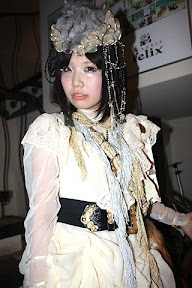 And click here and here for entries and snaps from the Grimoire Almadel blog. Hopefully in the next few days we'll see shots from Tokyo Fashion and Drop Tokyo!